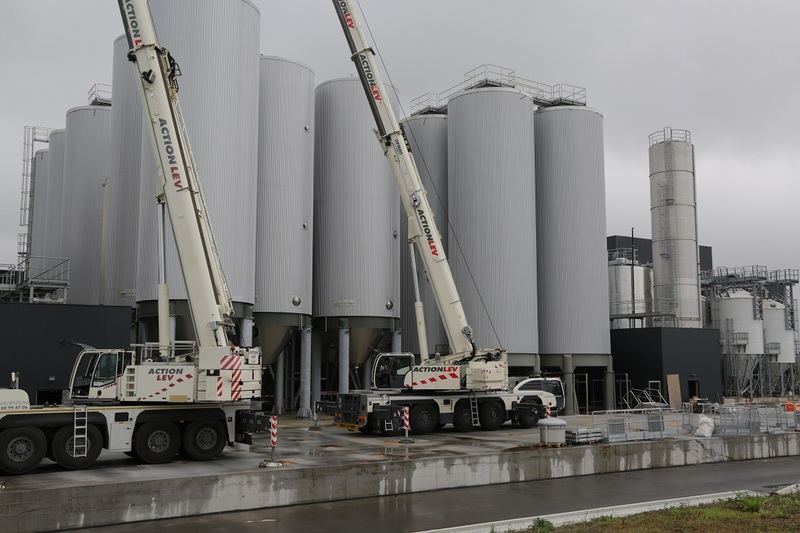 The French brewery Goudale recently called on Action Lev from Calais to install 24 new fermentation tanks in its craft of Arques, in Northern France. The lack of space which reduced the crane’s leeway was a major issue. To solve it, the lifting company used two Demag all-terrain cranes AC 100-4 and AC 160-5, respectively with a 100 and 160t capacity, and lifted in tandem. First, the four axled AC 100-4 with a compact design lifted the lower section of the tanks. Then, the other crane has been installed on a raised concrete floor dedicated to receive the new tanks to put the AC 160-5 at the nearest of their final position. « This ingenious solution let the access corridor available for the 6m convoy and the AC 100-4 positioning », summed up Jean-Christophe Accio, Sales Manager for France of Terex Cranes. Configured with counterweights respectively with 26,1 and 46t of maximum capacity, both Demag enabled the team to install six tanks a day thanks to this combination and finish the task in three days.